Original Editors - Dejonckheere Margo Andrea Nees Elien VanderlindenHeleen Van CleynenbreugelEls Van haver as part of the Vrije Universiteit Brussel's Evidence-based Practice project. Spondylolysis is a unilateral or bilateral bony defect in the pars interarticularis or isthmus of the vertebra. The term derives from the Greek words spondylos (vertebra) and lysis (defect). It can cause a slipping of the vertebra, in which case the term spondylolytic spondylolysthesis is used. Vertebrae consist of the vertebral body and a bony ring or arcus which protects the spinal cord. 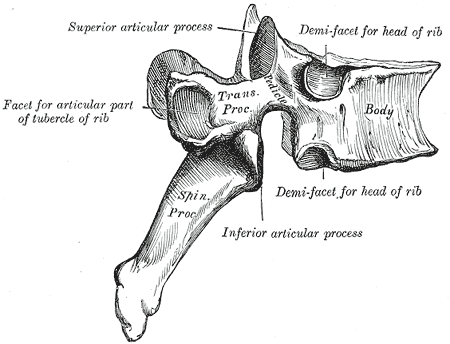 The arcus is formed by two pedicles which attach to the dorsal side of the vertebral body and two laminae, which complete the arch. The area between the pedicle and the lamina is called the pars interarticularis and is in fact the weakest part of the arcus. It is the pars interarticularis that is affected in spondylolysis. More information regarding spondylolysis in the young athletic population can be found on this page. Spondylolysis is considered to be a stress fracture that results from mechanical stress at the pars interarticularis. These stress fractures occur due to repetitive load and stress, rather than being caused by a single traumatic event. The stress distribution at the pars interarticularis is the highest in extension and rotation movements. Spondylolysis occurs mostly at L5 (80-95%) due to repetitve hyperextension,  which increases the contact between the caudal edge of the inferior articular facet of L4 and the pars interarticularis of L5. Specific symptoms depend on the region of the spine that is affected. Lumbar spondylolysis will show other symptoms than thoracic or cervical spondylolysis. Neurologic exam is usually normal but neurogenic symptoms can arise if the condition progresses to spondylolisthesis. Conservative treatment is usually sufficient to treat symptomatic spondylolysis and aims to reduce pain and facilitate healing processes. When severe pain is persistent, progression to spondylolisthesis needs to be prevented: surgical treatment may be required. This only occurs in some patients and evidence of long-term benefit is still uncertain. Latest procedures attempt a repair of the affected pars with preservation of the segmental mobility whereas earlier methods sometimes included a spinal fusion procedure. Facilitating the healing processes by promoting additional blood flow and thus healing of the affected pars. This can be accomplished by isometric contractions of the surrounding muscles. Strength and flexibility: As paraspinal muscle spasms and hamstrings tightness are often seen in patients with spondylolysis, stretching exercises can be added to the rehabilitation program. Flexibility training is useful in patients with hypomobility of the spine. A global strengthening program should be started which can include specific back strengthening exercises. Stabilization: Neuromuscular stabilization techniques, including activation of transversus abdominis and other core stabilizer muscles have be shown to decrease pain in some older research. This section includes education and postural training. There is evidence suggesting that specific trunk stabilizing exercises to spondylolysis. A detailed knowledge of spinal anatomy and maintaining patient function/quality of life is imperative. Objective interpretation of medical imaging is necessary in order to avoid making premature conclusions because there is a low correlation between clinical findings and symptoms. Due to the athletic background of most patients with spondylolysis, it is essential to be well informed about training principles and sports-specific exercises to provide the patient with the best care available. ↑ 3.0 3.1 3.2 3.3 3.4 3.5 Haun DW, Kettner NW. Spondylolysis and spondylolisthesis: a narrative review of etiology, diagnosis, and conservative management. Journal of chiropractic medicine. 2005 Dec 1;4(4):206-17. ↑ Ruiz-Cotorro A, Balius-Matas R, Estruch-Massana AE, Angulo JV. Spondylolysis in young tennis players. British journal of sports medicine. 2006 May 1;40(5):441-6. ↑ 8.0 8.1 8.2 8.3 8.4 Syrmou E, Tsitsopoulos PP, Marinopoulos D, Tsonidis C, Anagnostopoulos I, Tsitsopoulos PD. Spondylolysis: a review and reappraisal. Hippokratia. 2010 Jan;14(1):17. ↑ 9.0 9.1 9.2 9.3 9.4 Standaert CJ, Herring SA. Spondylolysis: a critical review. British journal of sports medicine. 2000 Dec 1;34(6):415-22. ↑ 10.0 10.1 10.2 Cavalier R, Herman MJ, Cheung EV, Pizzutillo PD. 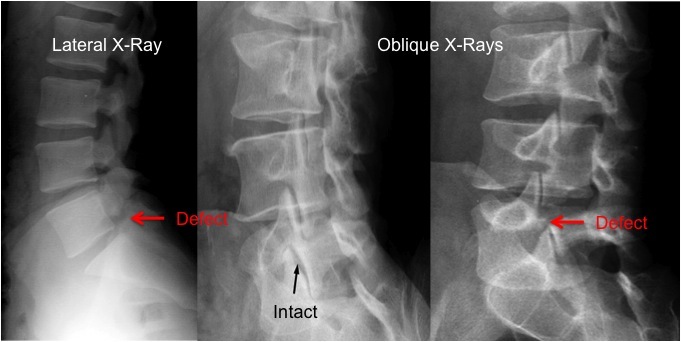 Spondylolysis and spondylolisthesis in children and adolescents: I. Diagnosis, natural history, and nonsurgical management. JAAOS-Journal of the American Academy of Orthopaedic Surgeons. 2006 Jul 1;14(7):417-24. ↑ 11.0 11.1 11.2 Ikata T, Miyake R, Katoh S, Morita T, Murase M. Pathogenesis of sports-related spondylolisthesis in adolescents: radiographic and magnetic resonance imaging study. The American journal of sports medicine. 1996 Jan;24(1):94-8. ↑ Freeman B. J. C. and Debnath U. K. The management of Spondylolysis and Spondylolisthesis. Surgery for Low Back Pain. 2010:4:137-145. ↑ 14.0 14.1 14.2 14.3 14.4 14.5 14.6 Leone A, Cianfoni A, Cerase A, Magarelli N, Bonomo L. Lumbar spondylolysis: a review. Skeletal radiology. 2011 Jun 1;40(6):683-700. ↑ 16.0 16.1 16.2 16.3 16.4 16.5 16.6 16.7 McNeely ML, Torrance G, Magee DJ. A systematic review of physiotherapy for spondylolysis and spondylolisthesis. Manual therapy. 2003 May 1;8(2):80-91. ↑ Steiner ME, Micheli LJ. Treatment of symptomatic spondylolysis and spondylolisthesis with the modified Boston brace. Spine. 1985 Dec;10(10):937-43. ↑ O'sullivan PB, Phyty GD, Twomey LT, Allison GT. Evaluation of specific stabilizing exercise in the treatment of chronic low back pain with radiologic diagnosis of spondylolysis or spondylolisthesis. Spine. 1997 Dec 15;22(24):2959-67. ↑ Garet M, Reiman MP, Mathers J, Sylvain J. Nonoperative treatment in lumbar spondylolysis and spondylolisthesis: a systematic review. Sports health. 2013 May;5(3):225-32. ↑ Ferrari S, Vanti C, O'Reilly C. Clinical presentation and physiotherapy treatment of 4 patients with low back pain and isthmic spondylolisthesis. Journal of chiropractic medicine. 2012 Jun 1;11(2):94-103.